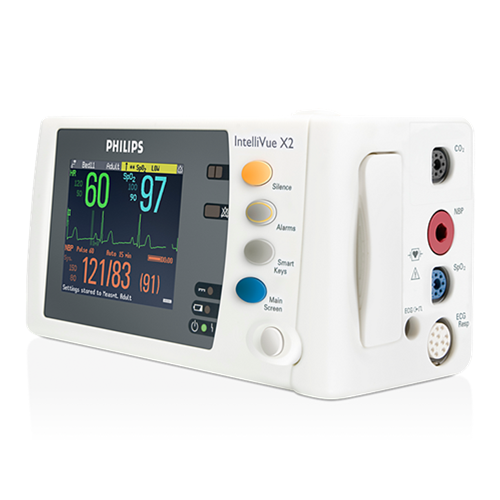 The� Philips IntelliVue X2 Multi-Measurement Module is a versatile patient monitoring device with a color touchscreen display. It can simultaneously monitor 3-, 5-, 6- or 10-lead ECG (including arrhythmia and ST monitoring), respiration, SpO2, NBP and either invasive pressure and temperature, or CO2. One of the lightest, smallest and rugged critical care transport monitors available. An MMS with the display, alarm capability, 3-hour removable battery, and extended trends. Crisp, colorful touchscreen with 3.5” display with seamless electronic recording. Transmits data wired or wirelessly to the IntelliVue Information Center, or just plug and play to upload data to another IntelliVue monitor. Sé el primero en valorar “Philips IntelliVue MMS X2” Click here to cancel reply.